Following recent dismal reports on rising unemployment, stagnant GDP growth, and a deteriorating economic outlook, we can only hope federal Finance minister Jim Flaherty will provide some Christmas cheer with changes “to better promote job creation and economic growth” (as he’s asked for advice on through his pre-budget consultations). First thing in the New Year, Flaherty is giving profitable corporations another big tax break, reducing the corporate income tax rate from 16.5% to 15%. That’s considerably less than the marginal rate most Canadians pay on their income from working – and it’s also far less than corporate tax rates in the U.S. This additional tax cut will be worth about $2.5 billion a year for profitable corporations. One of the big winners again will be banks and the finance sector industries: the additional 1.5 percentage point tax cut will increase their after tax profits by about another $500 million. Not too bad for a sector where the big banks reported over $6.1 billion in profits in their fourth quarter alone, a 36% jump over last year. For companies in oil and gas, mining, and petroleum and coal refining, this additional tax cut will increase their after tax profits by about another $300 million – also not too shabby for a sector that already benefits from about $1 billion a year in tax preferences and subsidies. And who’s going to pay for this additional $2.5 billion tax cut? Flaherty has made it clear it will come from cuts to public spending. The last federal budget announced another set of $4 billion in program cuts on top of cuts announced in previous budgets. Federal departments were told to provide lists with cuts of 5% and 10% from their budgets – and it looks like they will be going for the deeper cuts. It’s not just civil servants who will feel the impact: the cuts will be felt by other Canadians through reduced services, and lower demand with less spending and higher unemployment in the private sector as well. 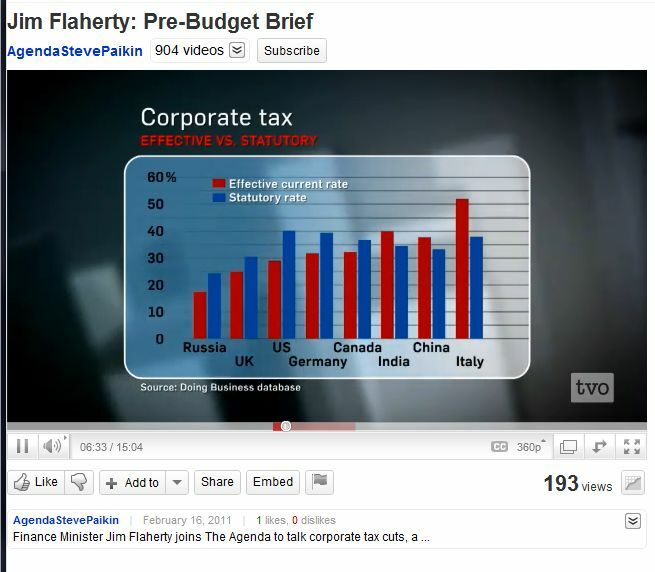 Standard economic multipliers reported in Flaherty’s own 2009 Budget and also used by private sector economists show that the economic and job impact of public spending is about five times that of corporate tax cuts. Corporate profits in the first three quarters of this year are 40% higher than they were two years ago, but business investment is only up by 14% during that time. No matter how much Flaherty, Bank of Governor Carney and others entreat and urge them, businesses are quite understandably not going to invest their $500 billion in excess cash back into the economy if no-one is going to buy their goods. Meanwhile the “hardworking people who pay their taxes and play by the rules” (that his party pledged tostand up for against the “privileged few” when it was elected six years ago) are paying the price for their mixed up priorities. There are 1.4 million Canadians unemployed and looking for work, not including those who have given up looking for work or involuntary part-time. Those who are working have seen their real wages and standard of living decline. Spending cuts and the resulting higher unemployment will make the situation worse next year. Slower economic growth will also mean lower revenues – and so the cycle will continue. Santa Flaherty should listen to some of his brightest economic elves who now seem to realize that things have been mixed up for a long time. And while they still may not have articulated how to set things right, he should go outside his kingdom for some advice from those who have warned about these problems for many years. Technical notes: economic multipliers from Finance Canada, Statistics Canada and elsewhere show that $1 in public sector spending increases economic output by an average of about $1.50 while $1 in corporate tax cuts increases economic output by only ~$0.30. Average employment multipliers for these measures are roughly proportional: public spending generates an average of 15 jobs per $1 million, while corporate tax cuts generate about 3 jobs per $1 million. This means $2.5 billion in corporate tax cuts would generate about 7,500 jobs and increase economic output by about $750 million. Meanwhile cuts to public spending of $2.5 billion would lead to a loss of about 38,300 jobs and a decline in economic output of about $3.75 billion – for a net impact of -30,000 jobs and -$3 billion in economic output. These multipliers include direct and indirect impacts, but they don’t include induced impacts (further spending by households). The 2009 budget with these multipliers had a footnote saying that corporate income cuts have a limited impact on aggregate demand in the short run “but have among the highest multipliers in the long run… because … they increase the incentive to invest and accumulate capital”. Multipliers showing strong impacts from corporate tax cuts generally come from what are called “computable general equilibrium models” that have little relevance to reality, as they assume no unemployment, etc. etc. It’s clear that corporate tax cuts haven’t done much to increase the incentive to invest so far – and aren’t likely to as long as we’re in a “prolonged period of deficient demand”.